Just playing with a heavy fog atmosphere in Vue 6 Infinite. 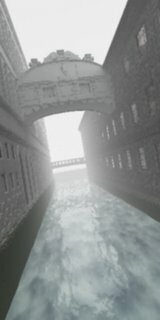 The water is a flat plain with a slightly tweaked dark water material added and the bump map turned into a displacement map. The model is the Bridge of Sighs from Cornucopia 3d.